I love a warm, comforting bowl of pasta for lunch on a cold winter day. 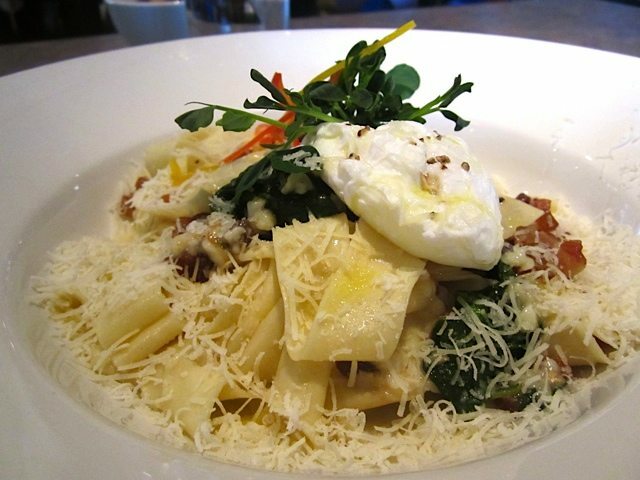 But then again, I love a good plate of pasta any time of day and, frankly, any time of year. On my very first visit to Pepper Garden last week, I needed no excuse to order the Belgian Hangover Pasta. Hey, I didn’t even have a hangover, but feel free to order it if you do; this is a cure-whatever-ails-you kind of dish. And ‘Tis the Season, as they say. But be warned. The ambiance will do little to settle a squeamish tummy. The nasty plastic coated menus, hideous patterned banquettes, and bad music do not seem to reflect the apparent care and attention paid to food and service at this east-end neighbourhood bistro(ish). That said, the pasta is the only thing I’ve eaten at Pepper Garden so far — until recently I had assumed it was a pan-Asian AYCE buffet. Let me say, I have a zero tolerance policy for restaurants that serve pasta but don’t know how to cook it. I was pleased to find my steaming hot ribbons of thin papparadelle pleasingly al dente and the poached (“Beking”) egg perched on top cooked just right — molten in the centre with fluffy whites just set. The “house bacon” was more like pancetta, with a nice meaty-saltiness rather than smoky flavour and it was chopped into appealing toothsome bits that clung to the noodles with the help of much-melted pecorino (freshly grated!) and the egg yolk, which was doing its darndest to act as sauce. I would have loved a heartier glug of good olive oil to help slick it all up, but I appreciated the curative hits of green instead — wilted spinach and fresh crunchy pea shoots as well as some slivers of sweet pepper as garnish and a good grind of black pepper. Ah yes, Pepper Garden — now I get it. Pepper Garden, 681 Montreal Rd., 613-749-2999.